On our farm we are always looking for ways to do more with less, improve efficiencies, work smarter and get more done with our hard working hours and dollars. We have slowly been moving away from hand line and wheel line irrigation and have made significant investments in linear irrigation systems. This year we made another move to even higher water use efficiency with drip irrigation in our hazelnut orchards. We plan to have at least half of our hazelnuts irrigated by drip this year. Which is exciting for many reasons. 1. Labor: We used to water with hand lines. This took a minimum of three people to move pipe two to three times a day, around 2 hours each move. And the cost of labor alone is going up significantly. With our drip it will take only one person to turn the pump on, monitor valves and lines. 2. Water when you want it and where you want it. Our drip system can easily be run from the pump that we already have and also can run at night when our pump is free from use on other crops. Simply put we can fill in the gaps to keep our pump running most efficiently. 3. We can inject fertilizer by small doses to our trees. We consider this a spoon feeding approach and it’s shown to help trees grow and produce nuts at a more consistent level. 4. 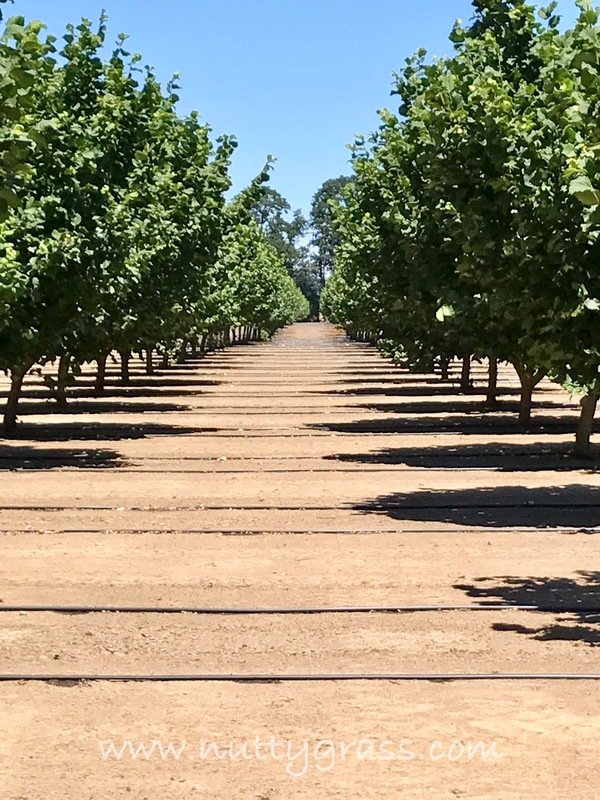 We can keep our trees healthier by being able to get into the orchard at anytime to spray foliar feeds, kill pests or protect from disease, and not have to pick up pipe that is always in the way. 5. Water from drip goes further. Drip irrigation has a 95% efficiency rating as compared to handlines which run at only 65%. Factors such as evaporation and run off are considered when making this determination. Here’s a short video of our drip coming out of the tubing. You may wonder why we waited so long with a list of positives this long, well on the flip side of the pro and con list lies the cost of putting a system like this onto our farm. 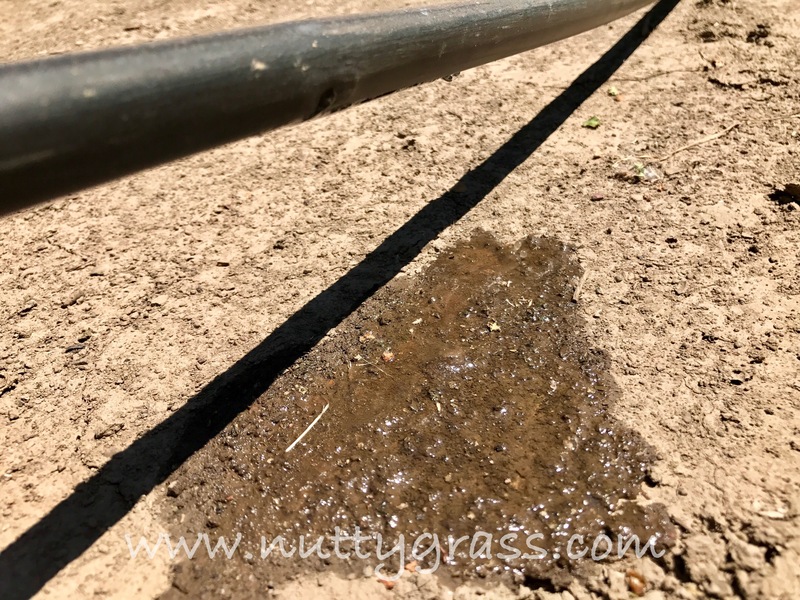 Luckily we already had the irrigation pump, but we had to add significant amount of underground mainline, put in a special filtration system, buy thousands of feet of drip tubing, build specialized equipment for putting the lines out and rolling them up. You can see it’s an investment in water, labor efficiency and equipment. So why now? Well first of all we have to budget beforehand in order to make improvements on our farm. This is one improvement that we finally found room to add to our budget. And secondly we had some financial help from agencies that are focused on energy and water efficient projects. One being the Natural Resource and Conservation Service (NRCS) and the other Energy Trust of Oregon. Both gave us funds to help us implement this project. We also have Stettlers Supply in Salem Oregon to thank for doing a great job on installation and heading up the project. This investment is one of those long term plans that I often reference. This is an improvement that will serve Matt and I as the third generation and hopefully the fourth, the fifth and on and on!